As anyone who reads this blog knows, I’m not the biggest fan of Belgian style chocolates with their high fat whipped sugary centres and moulded shell but I will always try then and give them a fair chance. This was the case when I went to visit chocolate maker Delight in Toronto and interviewed the woman behind them and tried a small number of the huge variety of fillings which change with the season. Not all Belgian in style, the fillings complimented the flavour they were carrying. The level of expertise and willingness to experiment was awesome. Maple Butter Chocolate – The milk chocolate shell was, I thought, a bit of a risk given what I knew would be a sweet centre but I soldiered on. Biting in to the soft centre made the chocolate squish but wow was it ever a delicious maple centre. Yes I know I’m not a fan of this type of whipped centre but I *am* a fan of all things maple and this certainly was one of the most delicious maple centres. I am thinking no more maple creams from Laura Secord. 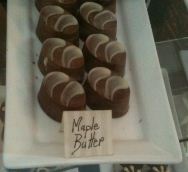 This may be my new favourite maple centred chocolate! Chocolate Caramel with Smoked Sea Salt – Again, I challenged myself as I am not a fan of the smoke flavour, avoiding it even in my bacon but I wanted to try this in a caramel. 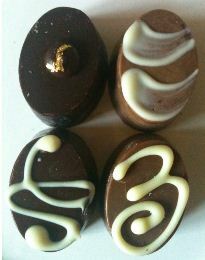 Here we depart from the high fat whipped centre and move to a soft but not runny caramel inside a dark chocolate shell. The caramel was superb and the caramel held a light but distinct flavour of the smoke. It was subtle enough that I was able to finish the whole chocolate unlike my experience with Charles’ Tea Chocolates. 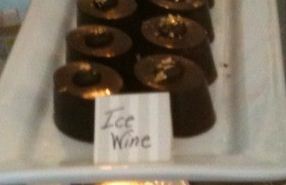 Ice Wine Chocolate – while not uniquely Canadian, it is something we are most proud of and I can say that 2010 will be an extremely excellent year for Ontario ice wine. This dark chocolate shell topped with gold leaf shows to what high standards Canadians can hold their ice wine and the creations they make from it. With its ganache filling, I was pleasantly surprised by the intense flavour of the ganache. The fruitiness didn’t quite come through for me but this was made with Callebaut chocolate(my notes were wrong – curse my bad handwriting!) fair trade single origin Dominican Republic chocolate as a base and so the brilliance of the filling was fighting with the lack of fruitiness in the base chocolate used. The bravery in not using a jelly to enhance the flavour and still achieving that slight acidity with a hint of fruity wine I thought was amazing. Spiced Hot Chocolate – dark but sweet, the hint of spice here was delightful. Not overpowering but suffused through the centre, it was a delightful combination of sweet chocolate in the milk chocolate covering, and a warming spicy centre. Thank-you for your review. I feel quite honoured. I would like to correct however your assumptopn that I use Callebaut. We use exclusively Fair Trade Organic chocolate here which comes primarily from the Dominican Republic, with a small portion hailing from Peru. As a former Callebaut user I find this chocolate to be superior. Once again, thank-you for making me blush. Curse my penchant for writing notes all over the page! I have fixed my notes and recommended you to a Toronto-based recommendation site as a fair trade, organic chocolate supplier! !